Options for a second light rail alignment through downtown Dallas have been studied for many years (since 2007! 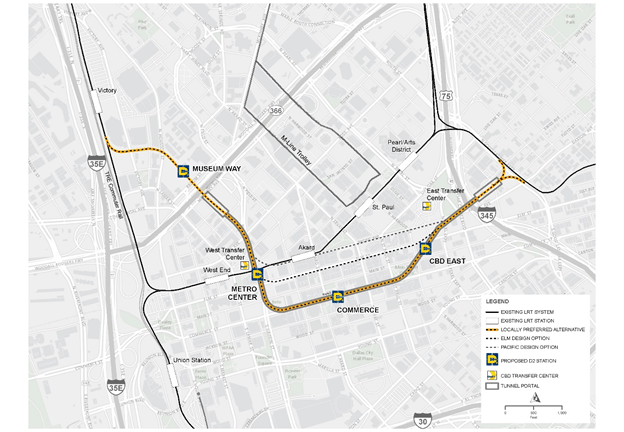 ), and DART is making strides for the selected D2 Subway corridor. Continue reading for the top 5 things you need to know about this underground alignment that will make movin’ and groovin’ a whole lot easier here in North Texas. That’s right! Last year, the Dallas City Council and the DART Board of Directors approved the D2 Subway Locally Preferred Alternative. This route travels from Victory Park to Deep Ellum, running parallel to Commerce Street through the heart of Dallas’ Central Business District. This alignment of the D2 Subway has four new stations, one on the surface, Museum Way, and three underground stations, Metro Center, Commerce, and CBD East. Although the stations have been identified, access points and precise underground locations are still being determined. DART is partnering with local stakeholders and the public to identify access points and work on integrating urban design elements to make the stations fit in with the existing area. DART wants to hear from you! DART is getting ready to launch its next round of public meetings starting September 12th in DART’s Board Room at Akard Station. Want more information on how you can learn more about the D2 Subway? Click here to sign up for updates. Why D2 for North Texas? The D2 Subway will provide much needed relief and flexibility for all light rail lines and traffic in the Central Business District and beyond. Currently, riders depend upon a single light rail line through downtown that constrains the mobility of the rest of the region. Having a second alignment will benefit all North Texans – not just those who ride – by providing easy access into and out of downtown Dallas. DART follows the Federal Transit Administration’s project development process. During this time, DART will prepare preliminary engineering designs and a Supplemental Draft Environmental Impact Statement (SDEIS) to assess benefits, impacts, and costs of the D2 Subway. This SDEIS will be made available for the public to review and comment in late 2019. There is a lot of information that will be coming during the project development phase. Make sure to sign up for updates and stay tuned to our DART Dailies for everything you need to know on the D2 Subway and the SDEIS. This entry was posted in Capital Projects, D2. Bookmark the permalink. I am fully behind the D2 development. Having the second line in downtown Dallas will help the entire region. As planning goes forward I think the folks in Irving should get info and meetings to discuss the Orange line adjustments that this D2 alignment provide. First I think it gives the Orange line more ready access to the Southern area of Dallas with the Green line. I hope it does not limit easy access to the important Red and Blue line options to the north. For instance at this time the orange line continues on prime times all the way to Plano with no required train change. We need to understand the way this will work with the new alignment. Along with all this discussion is the fact that the ride from Irving to Plano takes over an hour normally. Hope that planners can look to possibility of tweaking infrastructure so that there could in the future be express trains that didn’t have to stop at every station. If the Hi Speed Rail gets here with 90 minute time between Dallas & Houston, and then faces a ride time of an hour to many of the Metroplex locations we have a problem that limits value of system. I am now retired and ride DART periodically with friends and family. I like the system. We still need to do a lot to make the trips more user friendly. That goes for the ease of use of information, to the detail on getting people the ‘last mile’. I know DART is working on this diligently and I applaud you for that. Lots more to be done. I also follow the rhetoric between the Cotton Belt line and the D2 line. BOTH ARE ESSENTIAL.